Golden Concrete has been providing ready-mix concrete and gravel sales from our Golden, B.C. base for the last 23 years, serving a region covering Rogers Pass to the Alberta Border, and from Northern Columbia to as far south as Brisco. Our focus on quality, and superior level of service and professionalism, backed by an outstanding safety record, have made us the supplier of choice for a wide range of customers, including Kicking Horse Mountain Resort, many major construction contractors in Western Canada, as well as local builders and homeowners. No matter the size of your project, our skilled and experienced team of drivers, plant operators, quality control technicians, and concrete specialists are committed to completing it on time, to your specifications, and within your budget. Many employees have been with Golden Concrete for over 15 years, benefitting from our intensive product and equipment training. Golden Concrete has operated a batch plant facility on 11th Ave in Golden for over 20 years. On March 5, 2012, our batch plant and shop buildings were devestated by an overnight fire. Fortunately no-one was injured in the fire, but our plant, the shop, and much of our mobile equipment were completely destroyed. Our sister company Chetwynd Redimix mobilized a portable batch plant the day after the fire, and we were able to get back into operations providing top quality concrete to the Donald Bridge project just 12 days after the fire. We installed a brand new state-of-the-art batch plant in May 2012, and operated from this new plant while rebuilding the shop and plant facilities. Less than 9 months after the loss, we completed the reconstruction of our facilities. We are very proud of our new plant, which will enable us to continue to service our customers year round for decades to come. Golden Concrete is a proud member of the Golden community. We belong to the Kicking Horse Country Chamber of Commerce, and provide sponsorship to our local youth sports programs. Golden Concrete is a division of Interoute Construction Ltd., an integrated group of companies servicing communities throughout the interior of British Columbia, with operations that include ready mix concrete, hot mix asphalt production, road construction, excavation, aggregate crushing, and underground construction. Golden Concrete joined the Interoute group of companies in 2011. Orlando has over 20 years experience in construction and is ready to help you with your project. 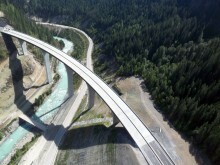 We're proud to have been part of the Park Bridge project over the Kicking Horse Pass. The Park Bridge over the Kicking Horse Pass is 92m high and 405m long, with a 6 per cent graded curve, and only one expansion joint. Using our extensive experience and knowledge of high-performance concrete, we were able to meet the requirements of these unique specifications.